Tighten your belts for the ultimate thrill-seeker experience. The main brand are Rebel Buggies, Rage Buggies or Madtrax Buggies. 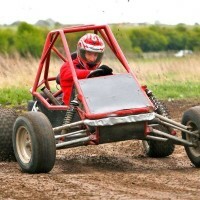 If you love the thrill of racing and want to get down and dirty while testing your driving skills, then Dirt Buggies are perfect. Let the adrenaline pump as you challenge yourself on off road tracks with plenty of bumps and hairpin bends. Rebel buggies are the latest off road karts to be developed with enhanced features. This buggy really does knock all the others off the top spot. Rebel buggies are the latest off road karts to be developed with enhanced features. This buggy really does knock all the others off the top spot. Some say it even handles better than the infamous Rage Buggy.. we'll let you make up your own mind. 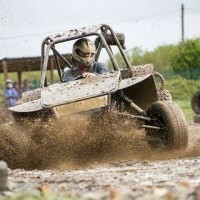 Rebel buggies are a great activity for both stag and hen parties, no matter what your experience is we have the expertise and knowledge to get you driving the racing lines better than Vettel himself! Bristol: 620cc Powerful Rebel Buggies. Average lap time 45 seconds. Bristol: Close to Cribs Causeway, just 15 minutes from the city centre on the outskirts of Bristol! Birmingham: Central Birmingham, next door to the Wheels Raceway. Race formats vary. In Bristol, it's a time trial race against the clock and see who really can keep their calm in these speed machines, around the 450 metre track - the aim of the game is to set the fastest lap time. Normally two x 620cc buggies on each track, with at least 1 spare on each track in case of mechanical issues. There is no overtaking permitted in this activity as the track isn’t large enough to allow 2 buggies to pass each other safely. Sessions last 1 hour, each driver gets plenty of driving time - contact us for more details. However in Birmingham, up to 6 buggies grace the track at a time. Vehicles are set off in a staggered start, but then it's all about head-2-head racing! The off road Rebel Rally Experience has individuals competing to achieve the six fastest laps. Each driver has three races in which to achieve this. Racing begins with a staggered start after which you can chase down and overtake other drivers. Lap times are measured by computer controlled timing equipment allowing you to track your position throughout the event. Medals are given to 1st, 2nd & 3rd, lap printouts are distributed to all drivers. .....Definitely book this, this is our best selling activity (along with Bubble Football) is one of the best places to visit for a Stag Do in the UK. .....A multi activity package for best value. Buggies can be combined with various activities at a single site for a great day out! .....A weekend package in Bristol like our Bristol Max Power Weekend, with accommodation & nightlife included + anything else you want. .....Giving us a call for the best recommendations and an Instant Live Quote if you contact via Live Chat.